It seems that Fujifilm is continuing to enhance its 3D product line, as after the launch of the 3D consumer camera FinePix REAL 3D W1 and the 3D photo frame FinePix REAL 3D V1, the company has just announced another 3D-capable product. 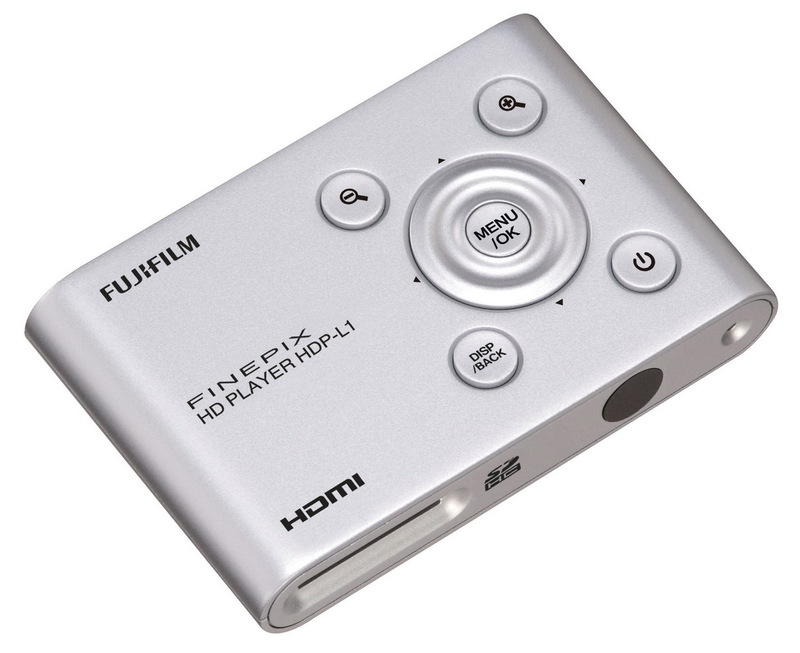 Fujifilm HD Player HDP-L1 is a 3D-capable photo and video player that can play content from SD/SDHC flash cards like the ones used in the REAL 3D W1 digital cameras (the player can also work with other non-3D Fuji digital cameras). The HDP-L1 player has an HDMI video output and can be connected directly to one of the new 3D-capable HDTVs and over HDMI and play back 3D content in 720p Side by Side format, either video in AVI format or 3D photos in MPO format (used by the W1 camera). This new product will allow you to easily view the 3D photos and videos on a larger screen than only on the small screen of the camera or on the slightly bigger V1 photo frame. So far the Fujifilm HD Player HDP-L1 has been announced only in Japan and the launch date for the product on that market is set for April 27th or in just few days and probably it will not take much time for the product to appear in Europe and America as well as the company’s 3D digital camera is already quite popular all over the world. What do you think about this product, do you think it may be useful, or the idea of having such non-universal solution is not so good? Is video output HDMI 1.4? Or even 1.4a? Forgive me, but is there any point to this? If it’s under 100 us, maybe.. but otherwise..
Who would keep their pics on a card? Aren’t you going to dump them to a computer or notebook and then format the card? Why 720p? I can currently view my pictures in 108op via HDMI out on my notebook to my Mits. Maybe I missed it.. if there is USB in (for an external hard drive) it would have a shot. Being a proud owner of a Finepix Real 3D W1 willing to buy a 3D TV in the near future I’m eager to put my hands on this player ! I own one of the W1 cameras too, love it. Looking forward to an updated model. It’s nice that advanced Stereo3D players exist, but I’m looking forward to at least basic support being more ubiquitous. It’s a barrier to 3D adoption when people still can’t easily view and manipulate the content they create. This device only addresses the “view” part, and only for the casual 3D photographer. I own the Finepix Real 3D W1 (firmware version 2.00) and just bought the HDP-L1. Sofar the HDP-L1 only shows standard JPEG images and does not recognize 3D *.mpo or * avi files. I am using the camera in Auto 3D mode because Fujifilm indicated that Advanced 3D mode pictures were not supported on the HDP-L1. Reported the problem to Fujifilm UK. I have the same problem as “Hans” Has anyone got the HDP-L1 to work on a 3D TV in “3D”? no matter with wich camera shooted. that does not came directly from the W1. Probably is a codec problem to be resolved. I’ve just purchased one from ebay, £25.00! Bargain.